A funny thing happened on the way to finding a place to work on our cars… That's how 502 Auto Club actually came about. We have several cars and were storing them in conventional storage units. When it came time to work on one we would have to get the car out, move it into our home garage, (displacing the wife's car), work on it, move it back. It was a pain. So we decided we wanted a place of our own to store and work on our cars. We have worked in restoration shops in the past so we had a good idea of what we wanted in a shop. When we mentioned what we were doing to our other friends with cars the idea grew. So now we have a 23,000 sq. ft. building with a fully equipped mechanical and body shop, and a paint shop with a downdraft spray booth staffed with seasoned professionals with decades of experience. 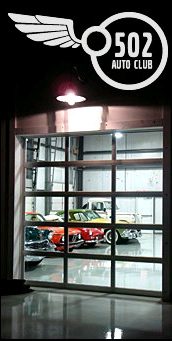 We have room to store 90+ vehicles in a climate controlled, secure building. It also has a showroom/meeting space that can hold over 100 people. Our philosophy is simple; treat our clients the way we would want to be treated. We provide friendly, professional service for every aspect of your collector vehicle: Storage, service, restoration, appraisals and consignment services are all offered.